As you probably know, Manifold is a remote-reliant organization — I’d estimate about half of our employees are remote, located in places like Denver, San Francisco, Toronto, and more. Our engineering manager Gary Poster has written an awesome series of posts about building a partially-distributed team, and in one of those posts, he talks about the importance of meeting in person for company retreats. Last week, Manifold did just that. Those of us that are remote traveled to Halifax to spend time with our coworkers in the office. We had meetings about important engineering and product topics, held a mini-conference, made time for 1:1s, and enjoyed some social events after work hours. In the past, these social outings have consisted of activities like VR gaming, rock climbing, and a trip to a trampoline park, all of which have been great for strengthening the team, and our individual connections. Gary was full of great ideas for this trip — instead of staying in individual hotel rooms, he proposed that the majority of the group share an AirBnB. This allowed us to spend more unplanned time together, whether we were sharing morning coffee, playing video games, or just chatting on the couch. Gary’s other brilliant brainchild was the potluck dinner we held on the final evening of the trip — since we had access to a large, shared kitchen, it made sense for us to have volunteers try their hand at preparing one or more of their favorite dishes. It was incredible to see the previously-unknown culinary talents of several members of the team, and some really amazing teamwork that happened naturally during the preparation of the meal. Gary kicked off the evening by preparing a wonderful Italian dish of mattricina sauce served over bowtie pasta. Of course, it was a big hit — how could you go wrong with the flavors of prosciutto, garlic, and white wine? 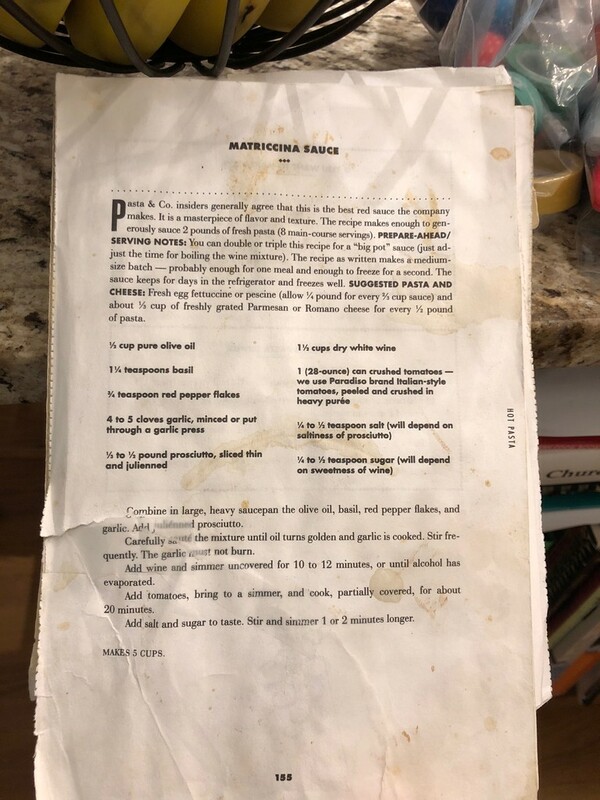 The dish was enhanced by the fact that he prepared the sauce by following a recipe from a cookbook he received as a wedding gift 20 years ago. Meg, who normally impresses us with her amazing design skills, took things up another level by preparing homemade gyoza. I’ve included the recipe she used, but I can’t promise you’ll have as much success as she did making the dough for the gyoza from scratch. Jelmer and I had some fun searching the grocery store for the ingredients she needed, and one of my favorite teamwork moments happened when Gary offered to help Meg by rolling out the dough and cutting out the many, many circular pieces Meg needed to stuff with the delicious pork filling. Our potluck took place on a cold and rainy day in Halifax. Nick thought there’d be no better dish to warm us up than a homemade soup. Paired with fresh-made tortilla chips, Nick’s soup was so well-received that I didn’t get to try it! Dessert is always a big hit in a large group, and over the past several months, I’ve been experimenting with different flavors in my baked goods. I love this oatmeal cookie recipe — it’s excellent as written with the pomegranate arils, but I decided to do something a bit different. I left out the pomegranate, and added a generous amount of matcha powder to the cookie dough. The cookies turn a very unique green color with the addition of the matcha, and the green tea flavor cuts the sweetness of the cookies a bit. Note: I quadrupled the recipe, and everyone was happy about this but me, as I had to make countless trips to the oven. The key to these cookies is only baking them for the prescribed 12–13 minutes, then letting them cool on the tray before transferring them to a cooling rack. When done right, this preserves the softness of the cookies. I think most people will agree that there’s few activities more enjoyable than sharing a great meal with friends. Many laughs and interesting conversations were had after the food prep was complete. As the night began to come to a close, those who didn’t cook were seriously committed to helping us clean up the kitchen. We had team members dedicate themselves to tasks such as washing the dishes, wrapping up leftovers, and returning the many pots, pans, and other miscellaneous items we’d used back to their proper homes. One of our engineers, Patrick, was even generous enough to bring home the unused groceries so that nothing went to waste. 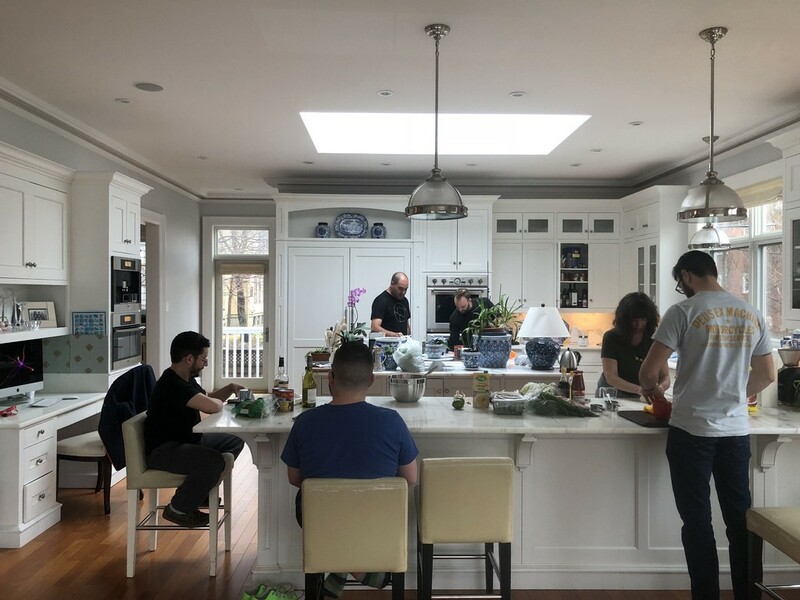 Alan, one of our newest teammates, was so impressed with the efficiency of the kitchen clean-up that he snapped this photo of all of us hard at work. 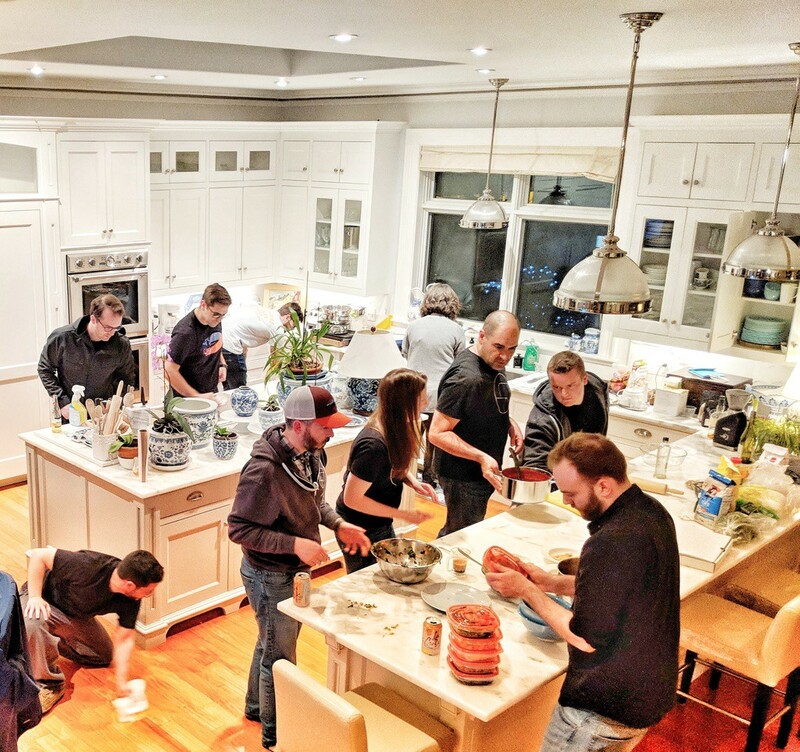 Here at Manifold, we’ve all agreed that the potluck dinner is an activity we’d be more than happy to repeat, and I’m sure we’ll report on the results again when we do.